TEAMS (Tests of Engineering Aptitude, Mathematics and Science) is a one-day competition for students in middle and high school that allows them to apply their knowledge of skills in science, technology, engineering and mathematics (STEM) to issues facing our global society. Focused on an annual theme, original academic and innovative concepts are developed for the competition based on the National Academy of Engineering’s Grand Challenges. Engaging in the challenges requires critical job-readiness skills such as teamwork, analytical thinking, and multi-dimensional problem solving. In 2016 students will explore topics such as optics, genomics and space exploration. TEAMS competition information can be found here. Teams of 4 to 8 students work together to answer multiple choice and short essay questions based on a National Academy of Engineering Grand Challenge theme. The 2016 competition will include topics such as optics, space and genomics. The competitions occur at a host university or at your own school during the competition window, February 8th–March 20th. 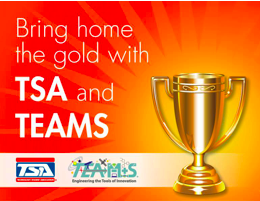 Top ranking teams qualify to compete in the national TEAMS competitions, scheduled to be held during the national TSA conference, June 28th–July 2nd, in Nashville, TN. TSA chapters can receive a 30% discount off of the $125 national TEAMS registration fee by using the TSA discount code provided when a TSA chapter affiliates.